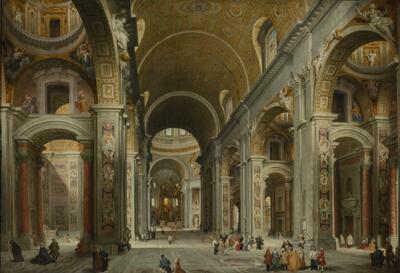 Pannini painted close to twenty versions of the interior of St. Peter's. This painting depicts the interior of the basilica as it looked prior to changes that occurred after 1743. It is based on a work, now in the Louvre, that was commissioned by Cardinal Melchoir de Polignac, French Ambassador to the Vatican. In these paintings, Polignac, dressed as a Cardinal, is in the basilica surrounded by a small coterie. The bold description of the vast interior and the sureness with which the architecture and decor are described on the canvas remind us again of Pannini's thorough familiarity with scenographic design. The Rt. Hon. Dowager Viscountess Galway, Serlby Hall, Nottinghamshire. The cardinal in red is just to the right of center, with a group of people around him. The guard in stripes is way over at the left, in front of a doorway… And I bet you found the dog—down front with the group of elegant ladies and gentlemen. Can you imagine taking your pet to church?! With a nave the length of two football fields and the height of a 13-story building, the interior of Saint Peter’s church is one of the most impressive sights in Rome. In this painting, Giovanni Pannini shows us how it looked in the 18th century, when all classes of Roman society—and their pets—congregated each day to promenade and gossip as well as pray. In the right foreground, a group of fashionable ladies and gentlemen are having a pleasant chat. In the far background under the light-filled dome, diminutive figures kneel beneath the spiraling gold columns of Bernini’s great baldacchino that marks the site of St. Peter’s grave. In the lower left corner, an old woman in black hurries off, clutching her rosary. A few feet behind her, stands one of the Vatican’s Swiss guards in the distinctive striped uniform still worn today. Pannini has chosen the top of the doorway beside the guard to inscribe his signature. Trained as a painter of theater sets, Pannini was a master of the art of perspective. His views of St. Peter’s were especially popular with wealthy foreigners who wanted a memento of their stay in the Eternal City. To the right of center, the man in the scarlet robes and cap is the French Cardinal de Polignac, one of Pannini’s most important patrons. Souvenirs di Roma, souvenirs di Roma! I say, old chap, I’d like a little trinket from Italy to take back home to merry old England…have you got a nice key chain? Or how about a snow globe? No, wait, I know—I’ll take one of those excellent oil paintings! Okay, maybe it wasn’t quite like that. But if you were a wealthy young man in the 1700s, part of your education was to go on “The Grand Tour”—a fabulous trip across Europe which could last up to eight years! Beats sitting in a classroom, doesn’t it? And once you’d visited the glories of France and Italy, you’d probably want a souvenir. But there were no postcards in those days. So artists like Pannini painted detailed, life-like “view paintings” of major sights for rich tourists so they could show off where they’d been. This one is of St. Peter’s in Rome. Until 1989 it was the largest church in the world. Here Pannini shows us more than the spectacular building. He also gives us a slice of life that tells a lot about the Italian church in those days. Has everyone come to pray, or are some just talking? Check out the different kinds of people….